Bass is one of the sought after game fish in the North America. Crankbaits are the most commonly used in bass fishing due to a wide range of variations that impact significantly on fishing success. Choosing the Best Crankbaits for bass fishing to use on a particular fishing expedition is a delicate affair that calls for critical thought. Crankbaits are made of either plastic or wood. Since different crankbaits are designed to catch different type of fish, it is wise that you go for the one that can catch the most expansive variety of fish. 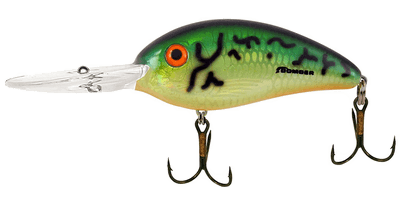 When shopping for bass fishing crankbaits, your focus should be an affordable lure that is appropriate for both large and smallmouth bass as well as other fish. Colour, shape, size, weight, lip configuration and price are important considerations. If You Are Looking For More Information About Lipless crankbaits Go Here Right Away. Shad Rap is designed to be fished at ultra slow speeds to super fast speeds. Manufactured by Rapala, the Rap 11 blue gold is made from balsa wood in the configuration of a natural baitfish. IAfter I received my rap 11 blue gold, I immediately fell in love with it due to its lifelike minnow finish. I also found this lure surprising due to its ability to kick almost 180 degrees left to right while I was fishing. Simply put, this lure moves horizontally instead of forward with each jerk. This motion also helps keep the lure in the strike zone for longer thus increasing its precision. When using this bait fishing detaching from it should be the least of your worries for it comes with premium VMC black nickel hooks. It is medium in weight with its standard version weighing 3/16 oz. Large and small mouth bass have no defense against the Rapala shad rap 11 blue gold. They simply cast resist it. The lure also features a slow sinking on-pause mechanism that is meant to keep it in the fish strike zone for longer. This lure is an excellent diver that goes deeper and faster than other lures. One of the features that I liked about this lure is the frantic ultra light wiggle with which it moves. This wiggle coupled with the sound waves generated by inbuilt rattles creates sound waves that easily lure fish to the bait. I also can’t forget to mention its terrific and enticing action. The type of hooks that come with this lure set it aside from rivals. It is fitted with sharp, rotating Tx3 Excalibur hooks to enhance precision. At only 2 inches and ¼ oz, the Bomber deep fat-free shad is lethal for both small and large mouth bass. 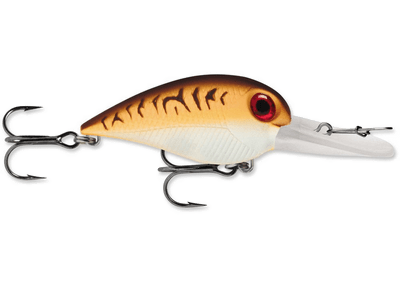 This crankbait comes with numerous great features that make them ideal for bass fishing. The first excellent feature for this lure is that comes with an integrated lip design to allow shallow, medium, and deep diving. This feature makes this lure the most ideal for largemouth bass fishing when compared to other lures. My three months old Storm wiggle wart has already caught several largemouth bass and two rainbow trout this summer. This lure also has the advantage of super strong hooks that again are ideal for fishing of both large and smallmouth bass. 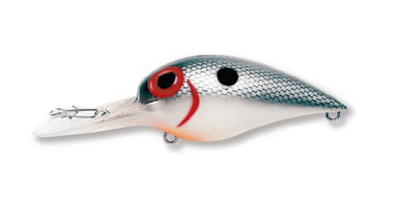 I also liked this lure for its side-to-side crayfish action and cadence-style rattle that make it super seductive for bass at different times of the day. The fact that this lure comes in a choice of more than 12 colors also adds to the strengths of this lure. At only 2.3 inches and 5/16 oz this crankbait can be summed up as smaller but more precise version of the Magnum wart. One of the best deep diving bass fishing crankbaits I have ever used. I couldn’t believe that little John could actually dive as deep as 20 feet until I tried it myself. And incredible little John actually made it to 20 feet. Spro and John crews the manufacturer of the little John designed it to run deeper, cast farther and fish easily. Spro little comes with an aerodynamic and streamlined design and a weight balancing mechanism for easy casting and retrieving. I could crank in the deep zones all day without getting worn out. The bright custom colors that come with this lure coupled with its small size and sharp Gumakatsu hooks make it ideal for catching any deep sea predator fish. This magnificent fishing lure is only 2 inches in size and weighs only ¼ oz. Manufactured by storm just like the wiggle wart the mossy fire is a great fishing weapon. It is only 2 inches in size making it ideal for both large and smallmouth bass which like baits between 2-5 inches long. I have used this bait severally, and I particularly like for their wide patined color choices. The bright reflective finish of these baits enhances their visibility. Baby bass, blueback herring, sunfish, and baby bass are the most common colors for this crank bait. I have found the blue-black herring color to be the best for daytime fishing. I kept on getting bites from both large and small mouth bass even in my late evening fishing expeditions. I would say that this excellent visibility is the main selling point for the Wiggle Wart. The strong premium VMC nickel hook is also a feature you need to consider to consider the wiggle wart. I bought mine in January 2018. 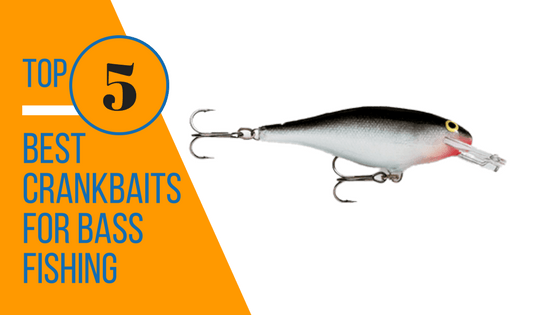 The five lures reviewed above feature as our Best crankbaits for bass fishing. Continue to read the blog for more updates or just subscribe to the newsletter to receive latest blog posts. Consider sharing this article, thoughts and Comments are welcome. If you are interested in finding more bass fishing lures then Click here Now.